Tuscany is a region in Italy known for its rich tapestry of art, architecture, food and wine. Tuscany is also famous for its sun drenched undulating landscapes punctuated by cypress trees. It is the epitome of a relaxed and sophisticated style of living. The mere thought of Tuscany conjures up images of enjoying simple clean foods at your villa under the mid-day Tuscan sun accompanied by the Chianti the region is so famous for. The Goddess on the Go ® offers a quick, delicious sandwich and salad to be enjoyed for lunch or dinner. She calls it a Taste of Tuscany for it brings the flavor of the region across the seas. Put sunshine in someone’s life by making them this meal – BE Goddess! - Mix mayonnaise, garlic salt and pepper. 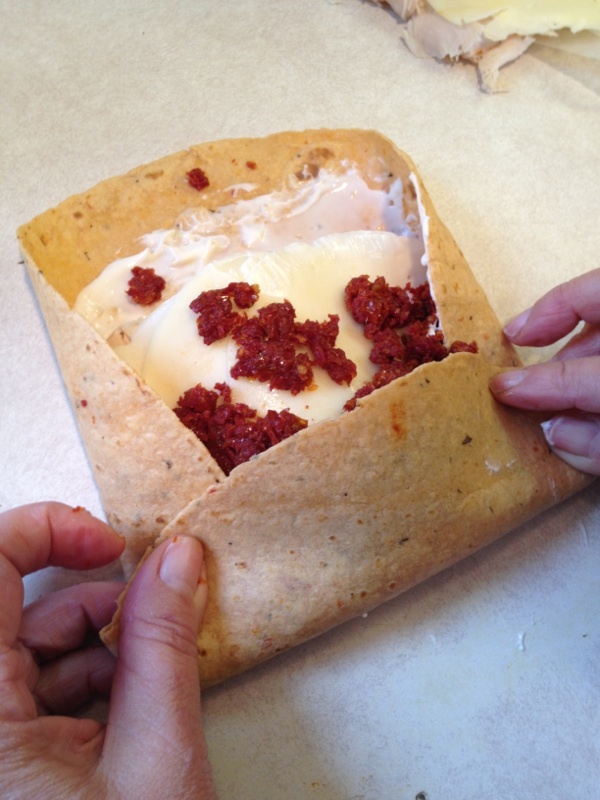 Spread about 2 teaspoons on the inside of each of two wraps keeping it an inch from the edge. - Sprinkle a heaping teaspoon of sun dried tomatoes on top of mayonnaise. - Roll about 4 slices of turkey or chicken breast and place on mayonnaise. Top with 3 slices of provolone. Top with more chopped sun dried tomato. Fold short ends in and then fold one long side over. Roll continually pressing. Place seam side down and slice on a diagonal. Serve with Etruscan Salad – recipe below.